Dr P W Finch, The Derald H. Ruttenberg Cancer Centre, Box 1130, Mount Sinai School of Medicine, 1 Gustave L. Levy Place, New York, NY 10029–6574, USA. BACKGROUND Keratinocyte growth factor (KGF) stimulates gastrointestinal epithelial cells in vivo, and is protective against gastrointestinal injury and colitis. Endogenous KGF is increased in inflammatory bowel disease (IBD), and may be an important mediator of mucosal repair. KGF is expressed by mesenchymal cells and activated intraepithelial lymphocytes (IEL). AIMS To investigate the relative contributions of these cellular sources of KGF expression in IBD. METHODS IELs and lamina propria lymphocytes (LPL) were isolated from inflamed and uninflamed IBD tissues. mRNA expression was determined by ribonuclease protection assay. In situ hybridisation was combined with immunohistochemistry to determine whether KGF mRNA was expressed by specific cell types in vivo. RESULTS Low levels of KGF mRNA expression were detected in three of five IEL samples derived from inflamed tissue, but not in two IEL samples from uninflamed tissue. No KGF expression was detected in LPLs from either inflamed or uninflamed tissue. In contrast, KGF was expressed by primary cultures of human intestinal fibroblasts, and was induced by treatment with interleukin 1. CONCLUSIONS The major source of KGF expression in IBD was lamina propria cells of non-immune origin, most likely fibroblasts and/or smooth muscle cells. Compared with these cell types, relatively little KGF synthesis was associated with IELs in inflamed IBD tissue. Keratinocyte growth factor (KGF) is a fibroblast derived member of the fibroblast growth factor family which has potent mitogenic activity on epithelial cells but not fibroblasts, endothelial cells, or other non-epithelial cell types.14 15 Systemically administered KGF rapidly induces the proliferation of epithelial cells from the foregut to the colon, providing functional evidence for its ability to activate gastrointestinal epithelial populations in vivo.16 KGF also protects mice from chemotherapy and radiation induced gastrointestinal injury and mortality,17and ameliorates mucosal injury in an experimental model of colitis in rats.18 We and others have shown that KGF expression is dramatically increased in IBD.19-21 In human fetal small intestinal explants KGF could partially mediate the epithelial hyperplasia induced by the activation of lamina propria T cells by a staphylococcus superantigen.22 These data indicate that KGF may be playing an important role in the normal physiology of the gut, and as an endogenous mediator of mucosal repair in inflamed intestine. Our previous study indicated that KGF mRNA in inflamed IBD tissue was present in a subset of cells in the submucosa which were distinct from the germinal centres, had morphological characteristics of lymphocytes, and a topographical distribution similar to that observed for the immunohistochemical staining pattern of T lymphocytes.19The notion that T lymphocytes might be synthesising KGF was supported by observations that certain T lymphocyte populations have been shown to synthesise a variety of growth factors for non-immune cells, including heparin binding epidermal growth factor,23fibroblast growth factor-1,24 and -2.23 In addition, the demonstration that in vitro activation of mouse γδ IELs isolated from dermal and intestinal tissue resulted in the stimulation of KGF expression25 raised the possibility that IELs may also represent an important source of KGF synthesis in an inflammatory setting. To investigate these issues, we undertook the present study in order to define further the cellular basis for increased KGF expression associated with intestinal inflammation. Twelve surgical specimens of ulcerative colitis and 15 specimens of Crohn's disease, comprising full thickness samples of the uninvolved and involved regions of the bowel, were collected directly from the operating room and used for isolation of IELs and lamina propria lymphocytes (LPLs). The specimens were inspected by a pathologist for histological features consistent with acute and chronic stages of IBD. Inflamed and histologically normal appearing tissue specimens were removed from the same resected tissue. All human tissues collected for this study were from surplus remnants in excess of that required for adequate pathological examination. The collection and use of these tissues for this study was approved by the Mount Sinai Hospital Institutional Review Board. For in situ hybridisation (ISH), tissues were fixed for eight hours in 4% paraformaldehyde in phosphate buffered saline (PBS) at 4°C. Following fixation, tissues were dehydrated through graded alcohols, cleared with toluene, and embedded in paraffin wax. Sections were cut at 6 μm and mounted on aminoalkylsilane treated slides. The procedure used is a modification of a method described by Bull and Bookman.26 Resected intestine was rinsed in cold Hanks's balanced salt solution (HBSS) containing gentamycin (50 mg/ml), penicillin/streptomycin (1% vol/vol), and amphotericin (1% vol/vol), and blotted free of mucus and debris on sterile gauze. The mucosa was then stripped from the underlying submucosa by blunt dissection and cut into small (2 mm) pieces. The mucosal pieces were incubated for five minutes at room temperature in 1 mM dithiothreitol (DTT) solution in RPMI 1640 (Life Technologies, Gaithersburg, Maryland, USA). The tissue was rinsed three times in RPMI and subjected to two dispase treatments (3 mg/ml dispase; Boehringer Mannheim, Indianapolis, Indiana, USA) for 30 minutes at 37°C with vortexing every five minutes to liberate the mucosal epithelial cell layer. The single cell suspensions from both incubations were separated from mucosal pieces, pooled, pelleted, and washed. Purification of IELs was achieved by centrifugation on Percoll (Pharmacia LKB Biotechnology, Piscataway, New Jersey, USA) density gradients for 30 minutes at 1600 rpm at 15°C. IELs were collected from the 40/60% interface, and typically contained 2–5% contaminating epithelial cells. Cells were washed three times in PBS and viability determined by trypan blue exclusion. Viability at greater than 95% was required for inclusion in these studies. The tissue remaining from dispase digestion was incubated overnight at 37°C in RPMI 1640, 1% fetal calf serum (FCS), collagenase (80 ng/ml, Boehringer Mannheim), DNAse (0.1 μg/ml), and soybean trypsin inhibitor (0.1 μg/ml) to liberate lamina propria mononuclear cells. After incubation for 18 hours, and subsequent passage of tissue through a wire mesh these cells were collected by centrifugation. The resultant cell suspension was enriched for lymphocytes by passage over a Percoll density gradient, collecting the cells at the interface of the 40–60% Percoll. At this stage LPL were typically >95% pure with 2–5% contaminating epithelial cells. Total cellular RNA from IELs and LPLs was isolated using the TRIZOL reagent (Life Technologies) according to the manufacturer's instructions. Human and mouse KGF cDNA probes for use in the ribonuclease protection assay (RPA) and ISH have been described previously.19 27 A 299 bp PCR fragment of human CD45 cDNA (nt 664–962), corresponding to all of exons 7 and 8, and most of exon 9,28 and a 300 bp PCR fragment of the human prepro-alpha 2 (I) collagen cDNA (nt 1771–2071)29 were cloned into the vector pCR2.1 (Invitrogen) for use as hybridisation probes for RPA. These fragments were sequenced to ensure the correct identity of the cloned fragment and that no errors had been incorporated during the amplification process. The mouse glyceraldehyde-3-phosphate dehydrogenase (GAPDH) template for producing antisense transcripts was purchased from Ambion Inc. (Austin, Texas, USA). Labelled antisense cRNA transcripts were prepared as described previously30 using 32P-labelled UTP (800 Ci/mmol, New England Nuclear, Boston, Massachusetts, USA) as the labelled nucleotide. RNA was hybridised overnight at 43°C with 1 × 105 cpm of gel purified probe. Hybrids were digested with 0.1 unit RNAse A and 20 units RNAse T1 (Ambion Inc.) for 60 minutes at 35°C. Protected fragments were resolved on 6% polyacrylamide, 8 M urea gels and visualised by autoradiography. ISH was performed on deparaffinised tissue sections using antisense cRNA transcripts labelled with 33P-UTP (1000–3000 Ci/mmol, New England Nuclear), as described previously.19 Probes were used at a concentration of 0.2 ng/μl/kb length of cloned fragment in hybridisation buffer (50% deionised formamide; 0.3 M NaCl; 20 mM Tris HCl, pH 8.0; 5 mM EDTA; 10% dextran sulphate; 1 × Denhardt's buffer; 0.5 mg/ml yeast RNA). Control sections received similar concentrations of the corresponding labelled sense strand RNA probe. Following processing for ISH, immunostaining was performed using primary mouse monoclonal antibodies, followed by sequential incubations with a biotinylated antimouse antibody, and peroxidase labelled streptavidin (Dako Corporation, Carpinteria, California, USA). Primary antibodies used were anti-CD3 (clone NCL-CD3-PS1, Novocastra Laboratories, Burlingame, California, USA), anti-CD20 (clone L26, Dako), and anti-CD68 (clone PG-M1, Dako), which are specific for T cells, B cells, and macrophages, respectively. Endogenous peroxidase was blocked by preincubation of tissue sections with 3% hydrogen peroxide in distilled water for five minutes. After incubation with the appropriate antibodies, staining was completed by incubation with 3′,3′-diaminobenzidine substrate-chromogen solution (Dako). The sections were then dehydrated, dipped in NTB-2 emulsion (Eastman Kodak, Rochester, New York, USA), diluted 1:1 in H2O, air dried, and stored desiccated at 4°C. After appropriate exposure times, slides were developed at 15°C in Kodak D-19 developer, diluted 1:1 in H2O, counterstained with haematoxylin, and mounted with coverslips. To investigate further the cellular basis of KGF expression in IBD, RNA was prepared from IELs and LPLs isolated from the intestinal mucosa of uninvolved and inflamed ulcerative colitis and Crohn's disease tissues. However, intact RNA was not recovered from every sample of isolated cells. This may be because of the small numbers of cells recovered from certain specimens, or because of cell death and subsequent RNA degradation that occurred during the isolation procedure. Of the 12 ulcerative colitis (UC) and 15 Crohn's disease (CD) specimens processed, intact RNA was isolated from the UC3 uninflamed (U), UC9 U, UC3 inflamed (I), UC4 I, UC7 I, CD8 I, and CD15 I LPL specimens, and the UC3 U, UC7 U, UC3 I, UC12 I, CD8 I, CD12 I, and CD15 I IEL specimens. These represent the samples that were examined for KGF mRNA synthesis by RPA. Included as positive controls for KGF expression were RNAs isolated from the embryonic lung fibroblast cell line, M426, HIFs derived from normal, ulcerative colitis, and Crohn's disease tissue, as well as a matched specimen of uninvolved and inflamed ulcerative colitis tissue. RNA from the MOLT-4 cell line33 was included as a positive control for T lymphocyte specific gene expression. KGF mRNA expression was not detected in either the two LPL RNA samples prepared from uninflamed tissue or the five LPL RNA samples isolated from inflamed tissue (fig 1). However, KGF mRNA was present at low levels in three of five IEL RNA samples from inflamed tissue, but not from the two IEL RNA samples from uninvolved tissue (fig 1). In order to determine that this was not due to hybridisation to transcripts derived from contaminating mesenchymal cells, the IEL RNAs were also examined for expression of the α2(I) chain of type I procollagen gene. Transcripts of this gene were shown to be present in a number of fibroblast cell lines derived from different tissues (including HIFs) but were not detected in a variety of non-fibroblast cell types including epithelial cells, lymphocytes, and endothelial cells (data not shown). 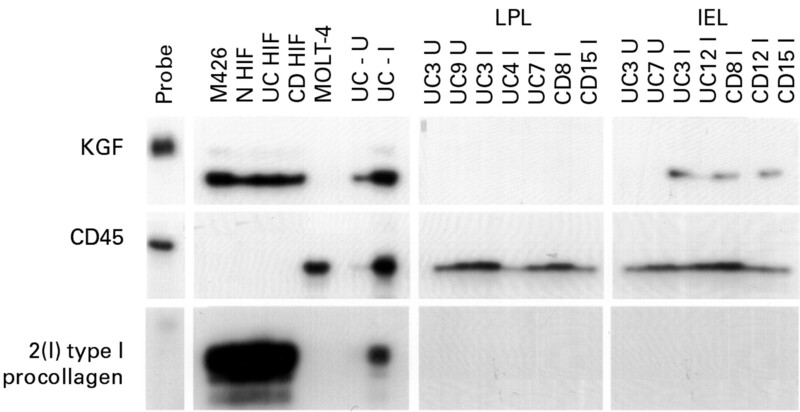 As can be seen in fig 1, high levels of α2(I) chain of type I procollagen expression were present in M426 RNA and each of the HIFs, but not any of the IEL samples. Analysis of keratinocyte growth factor (KGF), CD45, and α2(I) type I procollagen transcripts in lamina propria lymphocytes (LPL) and intraepithelial lymphocytes (IEL) isolated from uninvolved and inflamed inflammatory bowel disease tissues. RNAs (2 μg samples) were hybridised to 32P-labelled antisense probes and then digested with RNAse. Protected hybrids were resolved by electrophoresis through denaturing polyacrylamide gels. 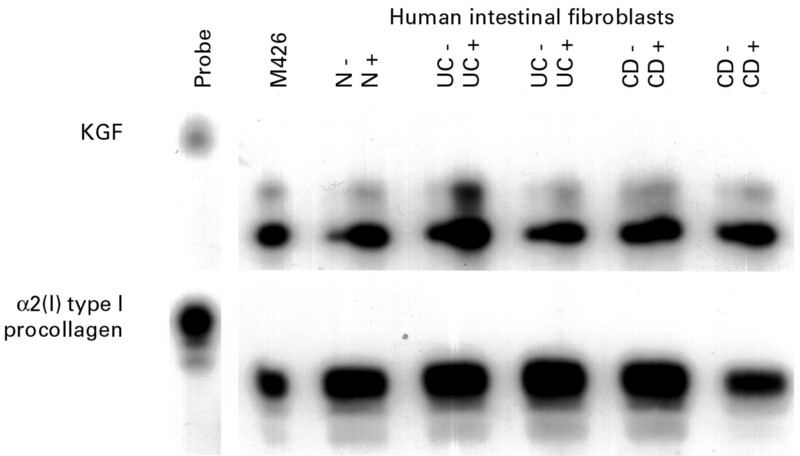 RNAs extracted from the embryonic lung fibroblast cell line, M426, and from three primary cultures of human intestinal fibroblasts isolated from normal (N), ulcerative colitis (UC), and Crohn's disease (CD) tissue, were included as positive controls for KGF and α2(I) type I procollagen expression. RNA isolated from the MOLT-4 T cell line was used as a positive control for CD45 expression. Total RNAs isolated from an uninvolved (U) and inflamed (I) region of ulcerative colitis were included for comparison. Exposure times were as follows: KGF, 72 h; CD45, 72 h; α2(I) type I procollagen, 24 h.
The same panel of RNAs were also examined for expression of CD45 mRNA, which encodes the leucocyte common antigen. The probe used in this study corresponds to exons 7, 8, and 9 which encode extracellular domain sequences that are common to all CD45 isoforms,28and therefore provides a uniform control for leucocyte specific RNA. CD45 mRNA was expressed in the control MOLT-4 cell line, and was present at increased levels in the RNA specimen isolated from the involved ulcerative colitis specimen relative to that isolated from the uninvolved specimen. The CD45 transcript was also present at varying levels in all the IEL and LPL RNA samples, but was not expressed by any of the HIFs. In order to identify further the cell type(s) expressing KGF in IBD, we performed ISH in conjunction with immunohistochemistry (IHC), using specific antibodies to label the major lymphocyte populations. To achieve this, three monoclonal antibodies, specific for T cells, B cells, and macrophages, were identified that were effective in staining paraffin wax embedded tissue sections after they had been subjected to the ISH protocol. Staining of serial sections which had not previously been processed for ISH verified that the same pattern of staining was produced using both methods (data not shown). Using this approach, uninvolved and inflamed IBD tissue sections were first processed for ISH using an antisense KGF cRNA probe, stained with one of the previously identified antibodies, and then exposed to emulsion. 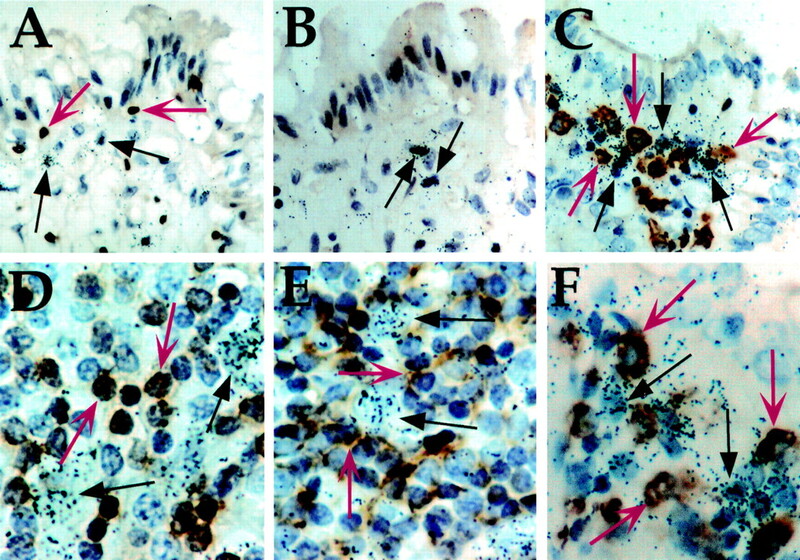 The results showed that the KGF expression (identified by the presence of autoradiographic clusters over KGF expressing cells) present in lamina propria cells immediately below the mucosal epithelial layer in uninvolved tissue,19 20 or throughout the submucosa in inflamed tissue,19-21 was not associated with cells identified as T cells, B cells, or macrophages by immunohistochemical staining (fig 2). Joint localisation of keratinocyte growth factor (KGF) transcript expression and T cell, B cell, and macrophage immunohistochemical staining in uninvolved and inflamed inflammatory bowel disease tissues. Sections were processed for in situ hybridisation using an antisense KGF cRNA probe. The immunohistochemical label (brown) was visualised after incubation with antibodies directed against the CD3 (A and D), CD20 (B and E), or CD68 epitopes (C and F), which are specific for T cells, B cells, and macrophages, respectively. Following exposure to NTB-2 emulsion, slides were developed and counterstained with haematoxylin. Autoradiographic grain clusters show cells expressing KGF mRNA (arrows). (A–C) uninvolved tissue, original magnification × 156; (D–F) inflamed submucosa, original magnification × 187. Representative immunohistochemically labelled cells in each section are indicated by red arrows, and KGF expressing cells, identified by autoradiographic silver grain clusters, are indicated by black arrows. The data described in the previous section show that KGF is synthesised at high levels in the inflamed submucosa by a cell population that presumably corresponds to a non-immune cell type. In order to provide further evidence for this hypothesis, primary cultures of HIFs, isolated from normal, involved ulcerative colitis, and involved Crohn's disease tissues, were incubated with IL-1α for six hours. IL-1α has been previously shown to induce KGF mRNA several fold in a variety of fibroblast cell lines following this type of treatment.34 35 RNA was prepared and KGF transcript levels were assessed by RPA. In all of the primary cultures examined, KGF was expressed and with the exception of one of the Crohn's disease derived cultures, this basal level of expression could be induced several fold by treatment with IL-1α (fig 3). By way of a control, α2(I) chain of type I procollagen transcripts were not altered by IL-1 treatment. Thus, IL-1 is a specific inducer of KGF mRNA in HIFs, and might account for at least some of the increased KGF expression associated with IBD. Induction of keratinocyte growth factor (KGF) mRNA by interleukin (IL) 1α in human intestinal fibroblasts (HIFs). Primary HIFs were derived from normal (N), and inflamed ulcerative colitis (UC) and Crohn's disease (CD) tissue. Cells were grown in Dulbecco's modified Eagle's medium containing 10% fetal calf serum until 90% confluent, serum starved for 24 hours, and incubated with 20 ng/ml IL-1α for six hours (+) or left untreated (−). RNA was prepared and 10 μg samples were analysed by ribonuclease protection assay for KGF and α2(I) type I procollagen. Exposure times were 24 hours for the KGF autoradiograph, and six hours for α2(I) type I procollagen. Analysis of KGF mRNA expression in isolated lymphocyte populations suggested that low levels of the KGF transcript might be present in IELs in inflamed tissue (fig 1). However, there has been no report of KGF synthesis by these cells in three studies in which KGF expression in IBD was examined by ISH.19-21 As the majority of IBD patients receive anti-inflammatory steroids to suppress the inflammation,3 and these agents have been shown to decrease significantly KGF expression in vitro,36 37 we reasoned that if KGF was actually being synthesised by IELs, we might be better able to detect its expression by ISH in tissue obtained from patients who had not been treated with steroids prior to surgery. As most IBD patients at Mount Sinai routinely receive steroids as part of their medical management, we examined past records in order to identify a sufficient number of patients who fulfilled this criterion. As this was performed retrospectively, only archival tissue blocks were available for in situ hybridisation analysis, and not RNA for RPA. Seven such patients were identified of which five presented with ulcerative colitis, and two with Crohn's disease. Of these patients, three were receiving 6-mercaptopurine, one was treated with cyclosporin, and two were treated with antibiotics only. In addition, we also examined two cases of inflamed ischaemic bowel as examples of non-IBD intestinal inflammation. To validate this approach, we first determined the effects of 6-mercaptopurine and cyclosporin on the induction of KGF mRNA expression by IL-1α in the 7–17 γδ T cell line, which was derived from dendritic epidermal T cells31and previously shown to express KGF.25 As expected, dexamethasone abolished the induction of KGF expression by this cytokine (fig 4). 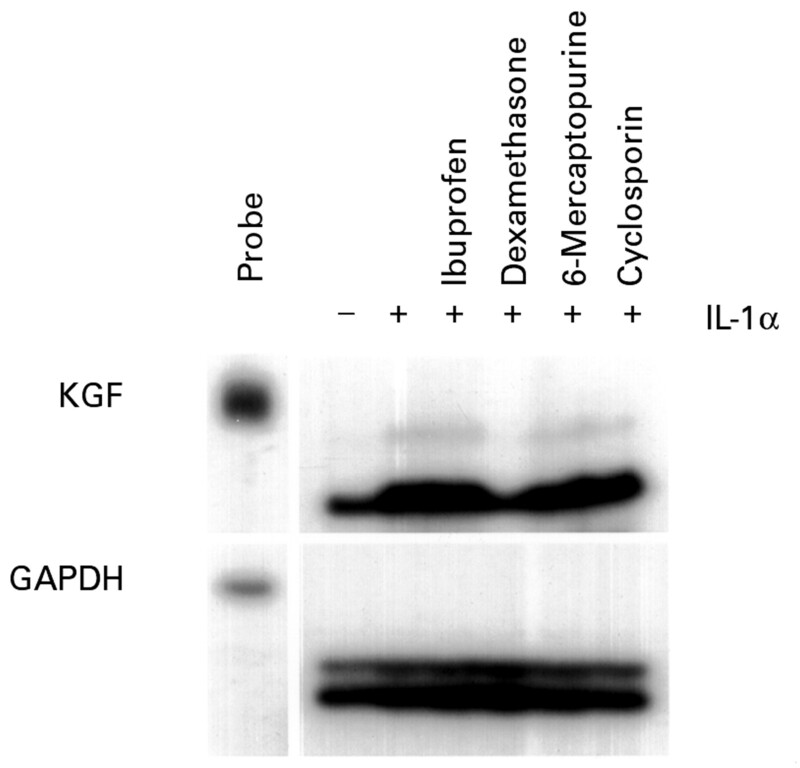 However, ibuprofen (a non-steroidal anti-inflammatory agent), 6-mercaptopurine, and cyclosporin did not significantly decrease the level of IL-1α induced KGF transcript expression in these cells (fig 4). The spatial pattern of KGF transcript expression in archival paraffin wax blocks of surgically removed tissue from these patients was examined using ISH. However, no detectable KGF hybridisation signal was associated with the IELs in the inflamed tissues from these patients (fig 5A, B), even though abundant signal was present in presumptive mesenchymal cells throughout the upper mucosa. These results indicate that IELs are not a major source of KGF in inflamed intestine, even in patients not receiving steroidal anti-inflammatory medication. Induction of keratinocyte growth factor (KGF) RNA by interleukin (IL) 1α in 7–17 γδ dendritic epidermal T cells. Serum starved 7–17 cells were treated for 12 hours with IL-1α (20 ng/ml) in the presence or absence of ibuprofen (120 μM), dexamethasone (100 nM), 6-mercaptopurine (10 μM), or cyclosporin (1 μM). The control culture received vehicle alone. Total RNA was prepared and 10 μg samples were analysed by ribonuclease protection assay. Exposure times were 36 hours for the KGF autoradiograph, and six hours for glyceraldehyde 3-phosphate dehydrogenase (GAPDH). In situ hybridisation (ISH) analysis of keratinocyte growth factor (KGF) RNA expression in inflammatory bowel disease tissue of patients not receiving steroidal anti-inflammatory medication. Sections were processed for ISH using an antisense KGF cRNA probe, and then for immunohistochemistry using an anti-CD3 monoclonal antibody. Following exposure to NTB-2 emulsion, slides were developed and counterstained with haematoxylin. (A) Ulcerative colitis; (B) Crohn's disease; (C) ischaemic colitis. Intraepithelial lymphocytes are indicated by grey arrows, and representative KGF expressing cells by black arrows. Original magnification × 187. High levels of KGF expression were also detected in both cases of ischaemic bowel examined. As fig 6 shows, KGF was expressed at high levels in the submucosa of inflamed tissue from areas in which the mucosal epithelium was intact (fig 6A, B) or areas in which it had been destroyed (fig 6C, D). Thus, increased KGF expression appears to be a common phenomenon associated with inflamed non-IBD as well as inflamed IBD tissue. In areas in which the mucosal epithelium was still intact, there was no evidence of IEL associated KGF expression (fig 6A, B). In situ hybridisation (ISH) analysis of keratinocyte growth factor (KGF) RNA expression in ischaemic colitis, shown in bright field (A and C) and corresponding dark field (B and D) micrographs of inflamed human intestinal tissue. Sections were processed for ISH using an antisense KGF cRNA probe. In (A), the mucosal epithelial layer is still intact, whereas in (C) the mucosal layer has been destroyed, and is absent. Numerous KGF expressing cells are present in the lamina propria of both tissue sections. Representative KGF expressing cells are indicated by arrows in (B) and (D). Stain: haematoxylin; original magnification × 62.5. This study was undertaken to define further the cellular basis of KGF overexpression in IBD. Analysis of KGF transcript expression in RNAs prepared from LPL populations, as well as combined ISH/IHC analysis of inflamed and non-inflamed IBD tissue did not detect KGF expression by immune cells. Given this result, we conclude that non-immune cells are the major cellular source of KGF in the lamina propria of IBD tissue. Mesenchymal cells, which frequently express KGF,14 27 would therefore appear to be the most likely cellular source of KGF in both the normal and inflamed intestine. In support of this conclusion was the demonstration that KGF was expressed by a number of primary cultures of HIFs derived from both normal and IBD tissues, and that IL-1 was a potent inducer of KGF expression in these cells. However, the primary cultures of HIFs likely represent cells of mixed phenotype rather than a distinct set of fibroblasts, and may also include mesenchymal cells derived from intestinal smooth muscle.32 Smooth muscle cells from a variety of tissue sources have been shown to express KGF transcripts.27 38Furthermore, as IL-1 treatment leads to increased synthesis of KGF mRNA and protein in smooth muscle cells,38 this cell population may also represent a significant source of KGF expression in IBD. In contrast to the data obtained with the LPLs, a low level of KGF expression was detected in three of five RNA specimens derived from IELs isolated from inflamed tissues while no expression was detected in two normal specimens. As we were not able to detect KGF expression in IELs in inflamed IBD tissue using ISH, this raised the possibility that the positive KGF hybridisation signal detected by RPA might result from a contaminating non-IEL cell type, such as fibroblasts or smooth muscle cells. The inability to detect expression of the fibroblast specific α2(I) type I procollagen gene in any of the IEL specimens would argue against this possibility. However, the presence of a KGF signal in the ulcerative colitis uninvolved tissue specimen, despite the fact that α2(I) type I procollagen expression was weak (fig 1), means that we cannot rule out the possibility that the KGF signal present in the IEL specimens was a result of mesenchymal cell contamination. Further experiments in which KGF transcript expression has been analysed in IELs that have been purified by flow cytometry will be required to confirm whether or not KGF can be synthesised by mucosal IELs. In previous experiments, constitutive KGF mRNA expression was shown in the immortalised 7–17 cell line by northern hybridisation analysis, and this level was further increased by activation (incubation with mitogenic lectins or cross linking of T cell receptors with an anti-γδ antibody).25 However, it is not known whether γδ IELs can be activated in a similar fashion in IBD, and the role played by these cells in this disease is still controversial. Immunohistochemical studies have not provided evidence that their numbers are increased.39 40 However, in a study which utilised flow cytometry and reverse transcriptase PCR assays, increased numbers of γδ IELS localised in areas of inflammation were found in the majority of patients with both ulcerative colitis and Crohn's disease.41 This expansion was attributable to an increase in Vδ1+ cells. KGF expression has been associated with T cells bearing Vδ1 receptors but not other γδ expressing subtypes.25 Coeliac disease, which is characterised by small intestinal mucosal damage and nutrient malabsorption following dietary ingestion prolamins in wheat, rye, and barley in genetically susceptible individuals,42 is characterised by a striking increase in the proportion of γδ IELs relative to αβ IELs in the intestinal mucosa,43-46 as well as high levels of epithelial proliferation.42 As this increase is one of the hallmarks of this disease,42 45 it would be of considerable interest to determine whether KGF was expressed by activated γδ IELs in coeliac disease. Our results showing increased KGF expression in ischaemic colitis, and those of Brauchle et al which showed that KGF was overexpressed in diverticulitis,20 another form of pathological intestinal inflammation, indicate that increased KGF expression is not IBD specific. In fact, we have also documented alterations associated with psoriasis, in which the epidermis is chronically inflamed.47 These results suggest that KGF may be involved in aspects of tissue repair in most situations where inflammation is manifested. Given that KGF protects mice from chemotherapy and radiation induced gastrointestinal injury and mortality17 these data indicate that KGF may be an important endogenous mediator of mucosal repair. We thank Dr C Fiocchi (Case Western Reserve University, Cleveland, Ohio) for providing primary cultures of human intestinal fibroblasts, Dr A Takashima (Southwestern Medical Center, University of Texas, Dallas, Texas) for providing the 7–17 γδ T cell line, and Drs M Babyatsky and S Itzkowitz (Mount Sinai School of Medicine, New York) for their help in identifying IBD patients who had not received steroidal anti-inflammatory medication prior to surgery. This work was supported by National Institutes of Health grant DK47102 (to PWF). (1994) Mucosal barrier. in Handbook of mucosal immunology. eds Ogra PL, Lamm ME, McGhee JR, et al. (Academic Press, San Diego), pp 41–52. (1990) Stem cells: attribute, cycles, spirals, pitfalls and uncertainties. Lessons for and from the crypt. Development 110:1001–1020. (1991) Inflammatory bowel disease. N Engl J Med 325:926–937. (1991) A major fraction of human intraepithelial lymphocytes simultaneously express the γ/δ T cell receptor, the CD8 accessory molecule and preferentially use the Vδ 1 gene segment. Eur J Immunol 21:1053–1059. (1988) Expression of the γ-δ T-cell receptor on intestinal CD8+ intraepithelial lymphocytes. Nature 333:855–858. (1998) Current concepts in mucosal immunity III. Ontogeny and function of γδ T cells in the intestine. Am J Physiol 274:G455–G458. (1996) Interleukin 2 (IL-2) and interleukin 7 (IL-7) reciprocally induce IL-7 and IL-2 receptors on γδ T-cell receptor-positive intraepithelial lymphocytes. Proc Natl Acad Sci USA 93:3613–3618. (1994) Interactions between stem cell factor and c-Kit are required for intestinal immune system homeostasis. Immunity 1:733–739. (1995) Interleukin 7 is produced by human intestinal epithelial cells and regulates the proliferation of intestinal mucosal lymphocytes. J Clin Invest 95:2945–2953. (1996) Chemokine expression in intraepithelial γδ T cells. Implications for the recruitment of inflammatory cells to damaged epithelia. J Immunol 157:985–992. (1994) Cytokine synthesis and apoptosis by intestinal intraepithelial lymphocytes: signaling of high density αβ T cell receptor+ and γδ T cell receptor+ T cells via T cell receptor-CD3 complex results in interferon-γ and interleukin-5 production while low density T cells undergo DNA fragmentation. Eur J Immunol 24:1301–1306. (1995) Homeostatic regulation of intestinal epithelia by intraepithelial γδ T cells. Proc Natl Acad Sci USA 92:6147–6151. (1989) Human KGF is FGF-related with properties of a paracrine effector of epithelial cell growth. Science 245:752–755. (1989) Purification and characterization of a newly identified growth factor specific for epithelial cells. Proc Natl Acad Sci USA 86:802–806. (1994) Keratinocyte growth factor induces proliferation of hepatocytes and epithelial cells throughout the rat gastrointestinal tract. J Clin Invest 94:1767–1777. (1998) Keratinocyte growth factor protects mice from chemotherapy and radiation-induced gastrointestinal injury and mortality. Cancer Res 58:933–939. (1996) Keratinocyte growth factor is highly overexpressed in inflammatory bowel disease. Am J Pathol 149:521–529. (1997) Keratinocyte growth factor in inflammatory bowel disease: increased mRNA transcripts in ulcerative colitis compared with Crohn's disease in biopsies and isolated mucosal myofibroblasts. Am J Pathol 151:1469–1476. (1998) Interactions between stromal cell-derived keratinocyte growth factor and epithelial transforming growth factor in immune-mediated crypt cell hyperplasia. J Clin Invest 102:1473–1480. (1994) T lymphocytes synthesize and export heparin-binding epidermal growth factor-like growth factor and basic fibroblast growth factor, mitogens for vascular cells and fibroblasts: differential production and release by CD4+ and CD8+ T cells. Proc Natl Acad Sci USA 91:2890–2894. (1993) The expression of acidic fibroblast growth factor (heparin binding growth factor-1) and cytokine genes in human cardiac allografts and T cells. Transplantation 56:1177–1183. (1994) Modulation of epithelial cell growth by intraepithelial γδ T cells. Science 266:1253–1255. (1977) Isolation and functional characterization of intestinal mucosal lymphoid cells. J Clin Invest 59:966–974. (1995) Pattern of keratinocyte growth factor and keratinocyte growth factor receptor expression during mouse fetal development suggests a role in mediating morphogenetic mesenchymal-epithelial interactions. Dev Dyn 203:223–240. (1987) Differential usage of three exons generates at least five different mRNAs encoding human leukocyte common antigens. J Exp Med 166:1548–1566. (1988) Structure of a full-length cDNA clone for the prepro alpha 2(I) chain of human type I procollagen. Comparison with the chicken gene confirms unusual patterns of gene conservation. Biochem J 252:633–640. (1984) Efficient in vitro synthesis of biologically active RNA and RNA hybridization probes from plasmids containing a bacteriophage SP6 promoter. Nucleic Acids Res 12:7035–7056. (1987) Regulation of T-cell receptor γ-chain RNA expression in murine Thy-1+ dendritic epidermal cells. Nature 328:263–266. (1998) Proinflammatory cytokines differentially modulate their own expression in human intestinal mucosal mesenchymal cells. Gastroenterology 113:1244–1256. (1972) Rosette-forming human lymphoid cell lines. I. Establishment and evidence for origin of thymus-derived lymphocytes. J Natl Cancer Inst 49:891–895. (1994) Regulation of keratinocyte growth factor gene expression by interleukin 1. J Biol Chem 269:10753–10757. (1994) Large induction of keratinocyte growth factor expression by serum growth factors and pro-inflammatory cytokines in cultured fibroblasts. Oncogene 9:3199–3204. (1996) Glucocorticoids inhibit keratinocyte growth factor production in primary dermal fibroblasts. Endocrinology 137:2232–2237. (1995) Suppression of keratinocyte growth factor expression by glucocorticoids in vitro and during wound healing. J Invest Dermatol 105:579–584. (1997) Differential expression of the keratinocyte growth factor (KGF) and KGF receptor genes in human vascular smooth muscle cells and arteries. J Cell Physiol 173:380–386. (1991) Immunohistochemical characterization, distribution, and ultrastructure of lymphocytes bearing T-cell receptor γ/δ in inflammatory disease. Gastroenterology 101:670–678. (1991) γδ T cell receptor-positive cells of the human gastrointestinal mucosa: occurrence and V region gene expression in Heliobacter pylori-associated gastritis, coeliac disease and inflammatory bowel disease. Immunology 84:440–444. (1997) Changes in human mucosal γδ T cell repertoire and function associated with the disease process in inflammatory bowel disease. Mol Med 3:182–203. (1995) Celiac disease. in Textbook of gastroenterology. eds Yamada T, Alpers DH, Owyang C, et al. (JB Lippincott, New York), pp 1643–1661. (1989) Intraepithelial T cells of the TCR γδ+ CD8– and Vδ1/Jδ1+ phenotypes are increased in coeliac disease. Scand J Immunol 30:665–672. (1989) Expression of disulphide-linked and non-disulphide-linked forms of the T cell receptor γδ heterodimer in human intestinal epithelial intraepithelial lymphocytes. Eur J Immunol 19:1335–1338. (1991) Gamma/delta T cells and the diagnosis of coeliac disease. Clin Exp Med 85:109–113. (1990) γδ T cells in coeliac disease. Res Immunol 141:668–671. (1997) Altered expression of keratinocyte growth factor and its receptor in psoriasis. Am J Pathol 151:1619–1628.